Kat -a- Pillo® bed kitty can really melt into. Size 17 inches wide 25 inches long 3 inches high. These beds are designed to fit kitty's curled up shape! Kitty will stretch, curl and melt into Kat -a- Pillo® comfort. Because they are hand crafted, each Kat -a- Pillo® has it's own "puffy" personality. 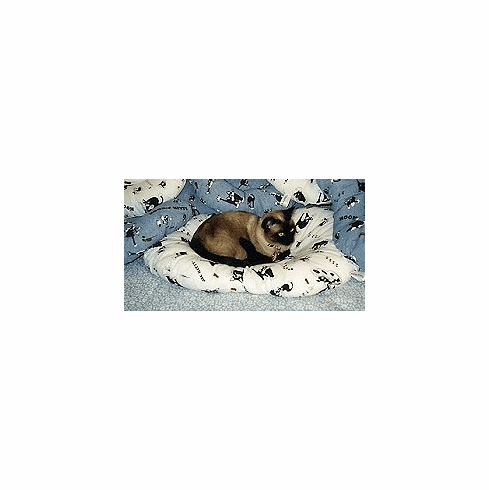 Beds are available in custom KOOKIE KITTY® fabric, Sherpa Top with custom KOOKIE KITTY® bottom or a variety of calico prints. "Duo" (double Kat - a- Pillo®) for the kitty who likes to curl up and snuggle with a friend! Just throw the Kat - a- Pillo® in the washer and dryer. It will come out clean, fur free and ready for the next Katnap! Kat -a- Pillo® comfort. Because they are hand crafted, each Kat -a- Pillo® has it's own "puffy" personality. Beds are available in custom KOOKIE KITTY® fabric, Sherpa Top with custom KOOKIE KITTY® bottom or a variety of calico prints. "Duo" (double Kat - a- Pillo®) for the kitty who likes to curl up and snuggle with a friend! Just throw the Kat - a- Pillo® in the washer and dryer. It will come out clean, fur free and ready for the next Katnap!